I have suggested on various posts that the City provide residents with free inexpensive bicycles that they could pick up and leave conveniently at designated kiosks throughout town. I thought I’d elaborate on this idea. However this will not be feasible until the City first makes most of our heavily trafficked streets SAFE to bicycle. The idea is for the city to purchase 5,000-10,000 inexpensive 1 to 3 speed bicycles painted an unattractive color and marked property of Cupertino so that no one would be tempted to steal such unattractive bicycles. These bicycles would be scattered throughout the city at transit stops, shopping locations, major intersections, centralized residential area, and other areas frequented by people with special smart bicycle kiosks that could keep track of available bicycles at that location. If a kiosk is not frequently used it could easily be moved to another location. Residents could recommend good locations for these kiosks from a website or smart phone application. These bicycles could also be taken home and kept over night to be used the next day. The bicycles would be unisex and be of one size for adults with quick adjustable seats. They would primarily be used for errands such as shopping or going to work but could be used by tourist by paying a fee and getting a temporary key card at the kiosk for $20 for each 24 hr. Bicycles would contain a basket for shopping goods or a briefcase. People using them would registered with the city and sign an agreement and disclaimer, pay an annual registration fee of maybe $100 and will be issued a special key card that unlocks the bike from the bicycle kiosk similar to bicycle share explained below. Their credit card would be on file and charged a daily fee of $20 if a bicycle is not returned to a bicycle kiosk within 24 hr. The cost of this program might come from a Transportation Impact Fee by new developments in the city as will as annual Transportation Fees for all business employing more than 20 employees based upon the number of employees. One would simply ride the bike to a destination, park it at a bicycle kiosk, do a chore such as shopping or going to work, then look at their smart phone application for the location of the nearest available bike, pick it up and return home to keep overnight. Alternatively a person could ride the bike to their destination, park it at any bicycle rack and lock it up, locking device to be provided by the rider, do their errand and pick the bike up again for their return trip. People wanting to take public transportation can simply ride a bike to the bus stop, park the bike in the designated bicycle kiosk and hop on the bus, very fast and convenient. Bicycles could be provided with a small metal flag on back that could be raised if the bike needs repair from a flat or other mechanical failure or simply indicate the problem on their smart phone application. Or the kiosk might have a means of flagging bicycles needing repair. Parts from retired bikes could be used to repair broken down bikes. There would be full-time and part-time employees who would collect bicycles needing service and repair them or simply do simple repairs right on the spot. 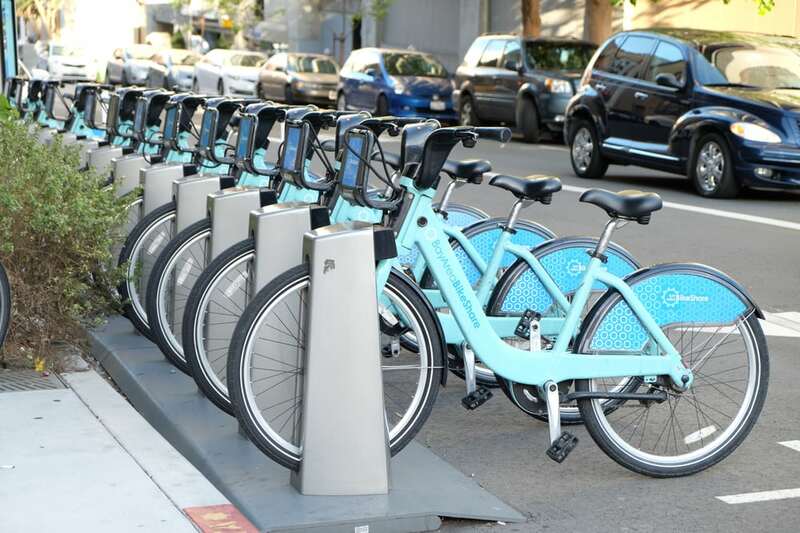 Alternatively there are bike sharing programs such as Bay Area Bicycle Share for a nominal rental fee and are usually free for the first 30 min. of use. See short YouTube videos below for how this works. This entry was posted in Bicycle, Ideas and tagged designated kiosks, errand, inexpensive bicycles, smart bicycle kiosk, taken home, tempted to steal. Bookmark the permalink.